This simple, simple dish is super, super tasty. It’s just a few ingredients, but it’s a dish much loved by Koreans. This version is simple, but you can dress it up with a bit of beef or pork. I posted a version of this recipe a few years ago that included the leftover sauce and drippings from a simple version of bulgogi, but the recipe was without a video. 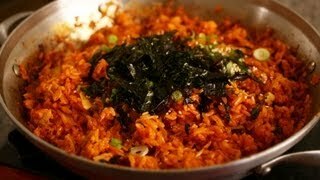 Eventually I made a video for more traditional bulgogi, and now I made a video for kimchi bokkeumbap too. 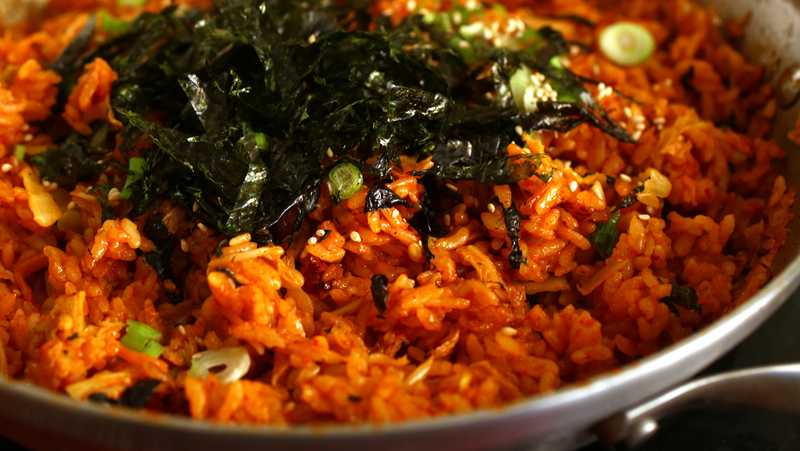 As you see in this video, you don’t need to prepare much in advance for kimchi bokkeumbap if you have kimchi and rice on hand. So of course I made it for him, along with grilled beef and lots of high protein food. As soon as he came home, I was ready to stir fry. He loved it! Heat up a pan. Add the vegetable oil. Add the kimchi and stir fry for 1 minute. 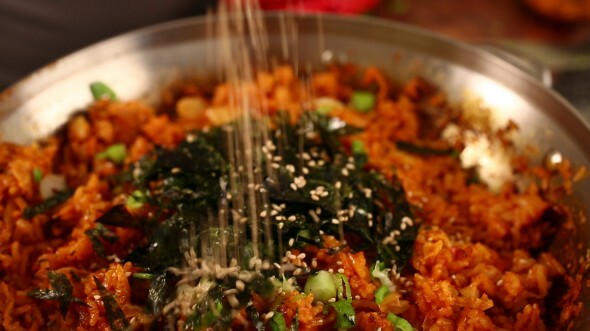 Add rice, kimchi juice, water, and gochujang. Stir all the ingredients together for about 7 minutes with a wooden spoon. Add sesame oil and remove from the heat. Sprinkle with chopped green onion, roasted gim, and sesame seeds. Serve right away. Posted on Wednesday, March 5th, 2008 at 10:03 pm. Last updated on October 5, 2014. Posted June 12th, 2008 at 5:42 am | Log in to reply. Posted April 12th, 2008 at 11:06 am | Log in to reply. oh, you made it, gratz! Posted April 12th, 2008 at 10:53 am | Log in to reply. Posted March 8th, 2008 at 10:40 pm | Log in to reply. Finest Glutinous rice flour sounds like sweet rice powder. You can use it. And also you can use plain flour to make porridge for kimchi making. That’s what I’m doing sometime. yes, you can replace beef with chicken or pork. However, in the case of pork, we usually use some hot pepper paste. Posted March 8th, 2008 at 8:52 pm | Log in to reply. great thanks for teaching us how to make the korea food.i went to korea once n try the dish similar with Bulbogi at restaurant, but they using pork instead. i’m happy that i found this blog so that i can try to make the kimchi as well as the kimchi fried rice myself, but,i cant find the “Sweet rice flour “(for kimchi)that you recommended,as you mentioned in your video,we can use normal flour, Can i replace it with ” Finest Glutinous rice flour” or i should use “plan flour” instead? Besides, if i don’ take beef, the marinate ingredient for preparing bulbogi can it be change to either pork or chicken? Posted March 7th, 2008 at 5:46 pm | Log in to reply. Congratulation! Your bulgogi making was successful! If the side dish soy beans are too hard, soak it longer time than 8 hours. Maybe 10 hours? Thanks for your update! Posted March 7th, 2008 at 12:39 pm | Log in to reply. My bulgogi turned out great! I meant the pepper paste you suggested as a sauce on the side (ssam jjang). In the end I forgot it, and everything was still great. The soybeans turned out a little dry, but I’m not sure if that’s how they’re supposed to be or if I didn’t soak them long enough. They taste good though. Thanks again Maangchi! I think my next project will be jja jaang myun, once I get the bean paste and noodles. Posted March 7th, 2008 at 5:41 am | Log in to reply. You made successful kimchi, kimchi stew, and jja jang bap? wow you must be good at cooking! 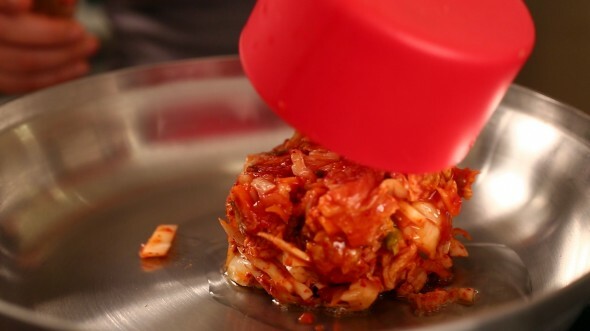 Regarding kimchi pancake, I’m sure you saw the vegetable pancake video. You can replace the vegetables with chopped kimchi. Anyway, I will include kimchi pancake in the list of my upcoming videos. Thanks! Posted March 7th, 2008 at 5:35 am | Log in to reply. Writing recipes and making cooking videos are the things that I’m doing these days. Problem is that my time is limited. Thank you for your advice. I will keep it in mind. Posted March 7th, 2008 at 12:24 am | Log in to reply. Your cooking videos are excellent! You present us not only the food recipe itself, but the Korean culture. Thank you for so many ones. 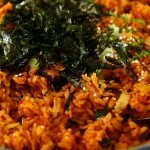 One particular characteristic of Korean food which attacts me most is its wide variety of side dishes. If you’re willing to, could you write for us some easy recipes for a list of side dishes? Just like this one, this doesn’t need to make a video. I think you can also make another blog, like the section of Ingredients, which particular focuses on side dishes. Posted March 6th, 2008 at 11:30 pm | Log in to reply. I watched Korean drama yesterday and they were having Kimchi pancake. Really mouth watering and it made me want to make it. Can you teach us someday. Hope it’s really soon. Thanks in advance. Your recipes are really good. I tried making kimchi, kimchi chige and blackbean paste rice. Really delicious. Posted March 6th, 2008 at 5:31 pm | Log in to reply. Which sauce are you talking about? 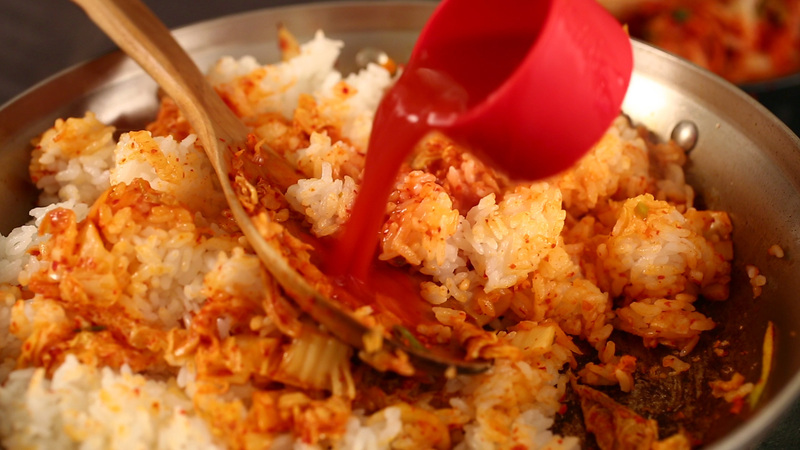 For bulgogi and kimchi fried rice, you don’t need hot pepper flakes. When you stir fried rice, you need hot pepper paste, so you don’t have to worry. Posted March 6th, 2008 at 3:03 pm | Log in to reply. I don’t have any red pepper flakes, but I have the paste…can I make the sauce with that, maybe just reducing the liquid? Posted March 6th, 2008 at 12:48 pm | Log in to reply. Mmmm I’m making this tonight! I’m also going to have the sweet soybeans on the side. Thanks Maangchi! Posted March 6th, 2008 at 12:52 am | Log in to reply. This recipe was originally posted on March 5, 2008 at 10:03 pm by Maangchi. It was last updated on October 5, 2014. The video was watched 2,783,228 times on YouTube & has 37,659 likes!